Caddy snaps securely onto BRUTE® container rims. 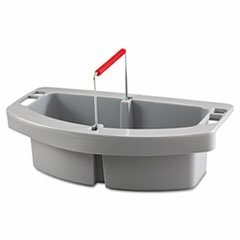 Compact, carry-around design with handle allows you to take the caddy where it's needed. Two compartments accommodate spray bottles, towels, can liners and more. Height: 5"; Width: 16"; For Use With: Rubbermaid® Commercial 44-Gallon Round Brute Containers; Material(s): Plastic. If you have any questions about this product by RCP2649GRA, contact us by completing and submitting the form below. If you are looking for a specif part number, please include it with your message.